an open source engine written by Jon Dart in C++. Arasan's development started in the early 90s, the first version, released in 1994 was a 16-bit program running under Windows 3.1 using an 8x8 Board, incremental updated attack tables and its own GUI, evolving to a portable 32-bit and later 64-bit program, utilizing bitboards to determine its sliding piece attacks with rotated bitboard lookups. In 2008, rotated were replaced by Magic bitboards, which gave Arasan about a 20-25% speedup . Lately I've been working on a new major release of Arasan. I have spent the last few months working on the search engine, trying to improve speed and performance. I tried some experiments with a bitboard move representation, but I have backed off on that for now. With bitboards, I got a nice reduction in tree size (bitboards allow a more accurate swap-down analysis than I had before, and this improves move ordering and allows better "culling" of losing captures in the quiescence search). However, currently the program relies pretty heavily on incrementally generated attack information, and I didn't have that implemented to work with bitboards, so I had to compute attacks as needed. Unfortunately, the current program "needs" to do this much more often than Crafty does, so the loss from computing attacks more than balanced out the gains from bitboards. This is fixable, I'm sure, but I've put off further work on it for now. The main change has been to re-work the code to use "magic" bitboard logic instead of rotated bitboards. This has given about a 20-25% speedup. I have also had to re-write the evaluation function to take advantage of bitboard attack functions for king safety and mobility. Arasan 19.2, released in November 2016, now applies Texel's Tuning Method by default and supports the Adam gradient descent algorithm  . As of version 21.0 in June 2018 Arasan comes with a Lazy SMP implementation. Arasan went online in December, 1996  , and played almost all major online computer chess tournaments, such as CCT Tournaments, ACCA Americas' Computer Chess Championship, ACCA World Computer Rapid Chess Championship, TCEC, and International Gsei Web Tournaments. Arasan 15.1  won the ACCA 2012  , Arasan 16.0 the WCRCC 2013  . 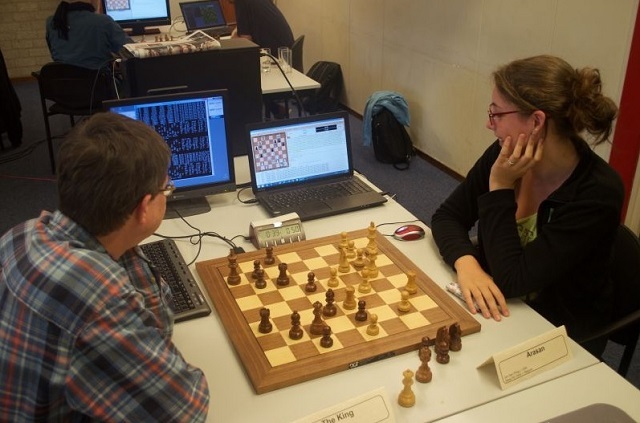 Over the board, Arasan is active at the CSVN Programmers Tournaments operated by Tessa Pijl. Arasan was runner-up behind The Baron in May 2014 at the PT 46 one point behind, as well in June 2015 at the PT 48 with the same score according to the tiebreak rules . This page was last edited on 27 February 2019, at 09:05.